From the outside, Mei may not seem all that different among the many Miami Beach condos. Where it completely stands out however is in its interior. This building has some of the most amazing and aesthetically pleasing Asian influenced interior design you're likely to come across in the entire city. What's more, you'll find that the substance is just as impressive as the style, essentially turning this building into one of the best condos to call home. 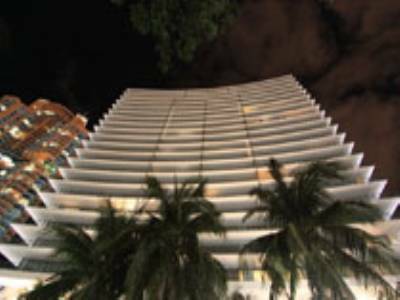 Unit 2001 is one of the Miami Beach condos within Mei Miami Beach. This residence has two bedrooms and bathrooms and has over 1300 square feet of living area. Just like the rest of the building, modernism abounds everywhere as evidenced by the tile and marble floors to the glass kitchen countertops, stainless steel appliances, sliding glass doors wood cabinetry and plush furnishings. From the balcony you'll be able to clearly see the sparkling oceanfront and the sands of Miami Beach itself. 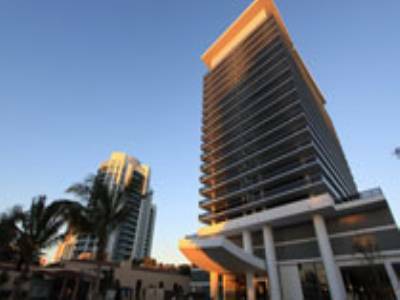 To learn more about unit 2001 and the Mei Miami Beach condo, please click here. If you drive north from the Miami Beach condos, you'll eventually reach Aventura. While many recognize the city for its Aventura Mall, it's got a large collection of condos for sale that are located in great areas including near the water or just moments from the beach. 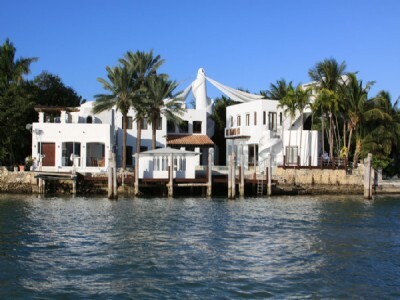 Today we'll be looking at pair of Aventura condos that are great alternative to those of Miami Beach. This duo of Aventura condos is called Peninsula, located to the southeast of Aventura Mall and standing right next to the waters of Dumfoundling Bay. At Peninsula you'll find a penthouse unit comprised of three bedrooms and bathrooms built in 2003. This stunning residence has over 3,000 square feet of living area and contains a host of features like a double door entrance, gorgeous marble floors, a spacious balcony that offers dazzling views of the bay and much more. 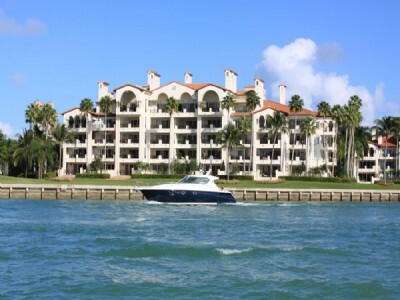 To learn more about the penthouse (unit 3103) and the Peninsula condos, please click here. 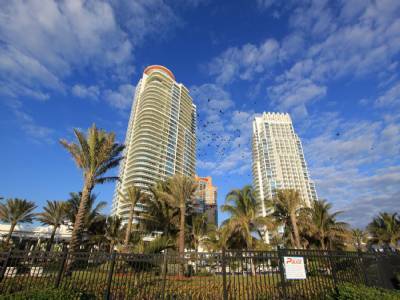 You can also view other Aventura condos and Miami Beach condos by exploring the rest of our website. To the west of the Miami Beach condos across the waters of Biscayne Bay are the Miami condos of the downtown area. Many of these are located near some of the city's most popular and classic hotspots including Bayside Marketplace and the American Airlines Arena. Because the area is comprised of high-rises, the views from here are absolutely captivating. 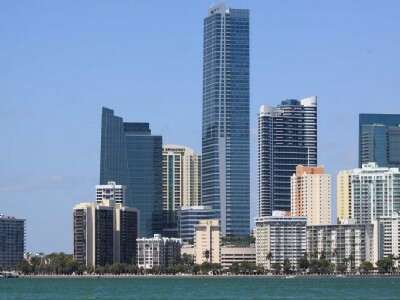 One of these Miami condos is 50 Biscayne, a soaring 54 story building that's easily recognizable by its distinctive rectangular mural near the top of the building. One of the residences within the building is identified as unit 2802, a three bedroom and two bathroom home featuring over 1700 square feet of living area. Features include a large wraparound glass balcony from where you can see the Miami Beach condos plus the downtown cityscape and the water, modern stainless steel appliances, granite kitchen countertops and much more. You can also enjoy the host of amenities available within the 50 Biscayne condo. 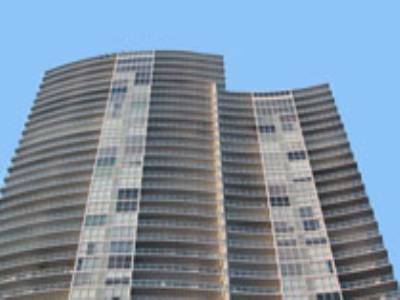 To learn more about unit 2802 and the 50 Biscayne condo, please click here. 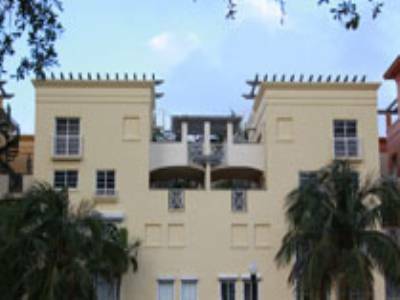 Considering how many Miami Beach condos there are to choose from, your choice as to which one to live in might have to incorporate appearances. While the old adage of “don't judge a book by its cover” remains true, the Waverly condo in the South Beach area remains one of the more unique buildings to call home. It offers just as much substance as it does style thanks to a one of a kind rooftop that gives the building its name. Inside Waverly is a two bedroom and two bathroom unit that you'll likely fall in love with if gorgeous views are a major requirement when buying Miami Beach condos. Unit 801 has just over 12600 square feet of living area and comes with all of the modern features you'd expect like granite kitchen counterops and marble bathrooms. From the balcony of unit 801 you can check out views of Biscayne Bay as well as the Waverly condo's pool deck. To learn more about unit 801 and the Waverly condo or to view other Miami Beach condos, please click here.